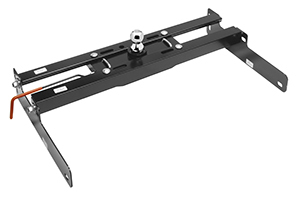 Draw-Tite - A gooseneck hitch is designed for use in a pickup truck and is similar to a Fifth Wheel hitch. The difference between the two is that the gooseneck uses a ball and coupler versus a kingpin and fifth wheel hitch. Typically, the trailers that are most commonly used with a goosenecks hitches are horse and livestock trailers.